In France, it’s more or less accepted that a crisis is an obligatory requirement for the entertainment and distraction of the masses. For months past, the weekly magazines, which serve to inform and titilate in equal measure, have been serviced by the exploits of DSK. What’s to be done when the public tire of the misadventures of this stereotypically Parisian plutocrat, half Pepe le Peu, half Napoleon Bonaparte? Un crise du sport, of course! 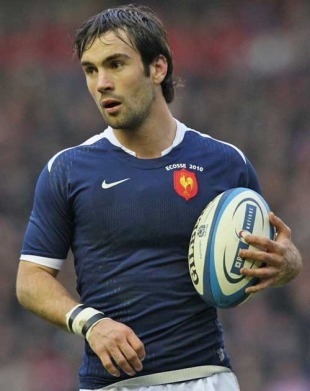 The crisis which is currently concentrating the minds of Frenchmen is the continued selection of Morgan Parra at out-half in place of Francois Trinh-Duc. Sport does not have the same centrality in French life as it does in Ireland. The population is huge and its interests diverse. Not for the average Frenchman the disturbance of his weekend pattern to watch a broadcast of his National Team playing at the ungodly Sunday hour of 7am against the Pacific islanders of Tonga. He will hear of their victory at the appropriate moment after coffee, brioche and jam …. hmm. Prioritise, Frenchy. But create a crisis such as that perpetrated by French coach, Marc Lièvremont, and everybody in France has an opinion and an involvement which gives them an in-depth knowledge and certainty that Lièvremont has made the wrong decision … again. In selecting the young Clermont scrum-half as out-half on the national team – perceived always as the role of “le General” – Lièvremont has enlivened interest in his team in a manner that not even victory against the All Blacks would have guaranteed. The coverage has been spiced by interviews and ‘leaks’ from team-mates of Parra and Trinh-Duc in New Zealand and former internationals and coaches in France. It has made the front page of the internationally-renowned L’Equipe newspaper, and dominated the twice weekly rugby paper Midi Olympique, which covered the story on more than five of its characteristic yellow pages. Two Government Ministers even offered their opposing views on television recently. Yes, they certainly do things differently in France. So what’s the meat of the argument? In essence the complaint is that Lièvremont has had two years to settle on a team, and in particular on his half-backs, but has copped out because his chosen scrum-half Parra is not playing as well as his competitor Dimitri Yachvilli. The latter plays for Biarritz, where he captains the team and dominates most games in which he plays, both by his general play and also his outstanding place-kicking. Furthermore, he has an almost telepathic relationship with Basque hero Imanol Harinordoquy, considered by many international commentators as the outstanding French forward of the past decade. But it is on the background of these two players that many of the conspiracy theorists have focussed in this debate. Yachvilli and Harinordoquy have strong Georgian and Basque heritage respectively. Both play with Biarritz, a club part-owned and totally dominated by former French full-back and now successful entrepreneur, Serge Blanco. Lièvremont would have played for Perpignan [a team with a strong Catalan heritage] against Blanco’s Biarritz in the late 80s/early 90s, and therein lies the nub of the allegations. Lièvremont has already been replaced as the French coach, to take effect immediately after the World Cup. However, it is perceived that the French team has not reached its potential under him and so – it is surmised – the coach is seeking to create additional scapegoats to stand beside him in the dock of public opinion after France fail in the anticipated manner. The allegation is that he would like to ‘finger’ Yachvilli and Harinordoquy, whilst handing credit to Parra and his Clermont team-mate Rougerie. Don’t shoot the messenger: this is a discussion that has grown legs in French rugby circles. However, this theory was undermined by the selection of a young up-and-coming Biarritz player – enormous nipper Raphael Lakafia – in place of Harinorduquy at No8 for the match against Tonga. It didn’t pan out well for Lakafia, and Harinodoquy came off the bench to put in a good performance and ultimately regain his place for the quarter-final. The probable truth of the matter is that the coach and his two fellow selectors figure that the only way in which this French team might claim an unexpected victory in RWC11 is by playing a very open and unstructured game against England in the quarters, Ireland or Wales in the semi and ultimately New Zealand or South Africa in the final. It’s worth noting that Lièvremont never selected Parra as starting out-half until Ireland beat Australia during this World Cup. Parra has certainly played at out-half during games, but he hadn’t been previously selected in the No10 jersey. The French, uniquely, have switched players between scrum-half and out-half in a fashion that many other nations envy, but none have replicated (with the possible exception being the South African and Ulster experiment of Pienaar). This analysis, offered among countless others in the pages of Midi Olympique, contains one pearl for Irish followers. The French think-tank is confident that the Irish will advance to a semi-final at the top of the draw. Certainly, they are confident that they can beat the Irish, but hearteningly for us, they believe that we are their most likely opponents in that semi-final. So one country’s crisis provides the light in the tunnel for another’s heartache. With this rationale firmly fixed in the mind, another week of this crisis might just be tolerable. After that maybe DSK will attend the semi-final in Auckland so that French news editors can get back on track and feature stories with good looking women alongside every headline! This entry was posted in RWC 2011 and tagged Dmitri Yachvilli, DSK to the rescue, Francois Trinh-Duc, I Am Not A Clumsy Clouseau-esque Waiter, Morgan Parra, Serge Blanco by dementedmole. Bookmark the permalink.